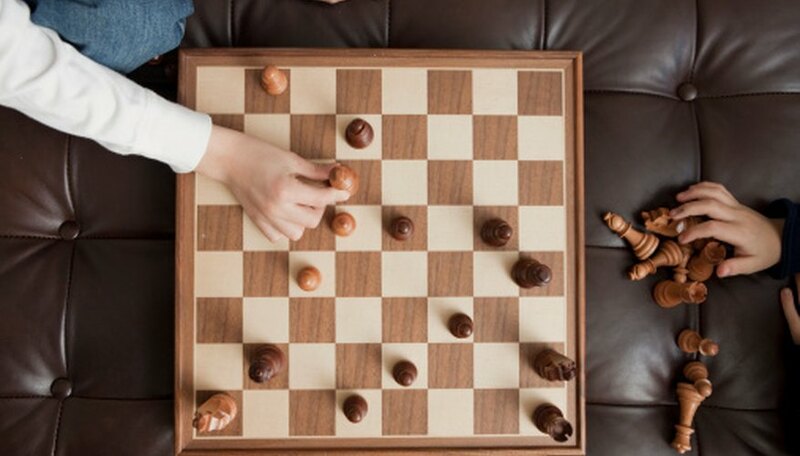 Making something on your own can be a rewarding experience, and if you really love chess or checkers, it can be fun to make your own chessboard. Templates are useful ways to simplify a more complicated process, such as drawing the pattern on a checkerboard. Once you get the template set up, making the chessboard is a very simple painting job. Because of the similarity in the boards, if you make a chessboard, you also have a checkerboard. Prepare the wood board by cutting it to shape and sanding it down. Many templates are designed to fit on an 8.5- by 11-inch sheet of paper, so a piece around that size will work with the templates. Sand the board smooth for better painting. Download and print off a template. There are a few listed under Resources, if you don't already have a template. Lay out strips of masking tape on the board side-by-side, so they create a single sheet of tape. Lay the template on top of the sheet of masking tape. Use the utility knife to cut out the pattern in the masking tape. You may find it easier to cut the vertical lines of the template, then rotate the template 90 degrees, and cut along the same lines again. Remove the alternating squares of masking tape to create the negative checkerboard pattern in the masking tape. The negative is the opposite of the image as it will appear when the template is removed. You have made a second template now. Paint or spray paint over the checkerboard template. Wait for the paint to dry. Remove all of the masking tape from the checkerboard. If you want to finish the board, do so after the tape is removed.